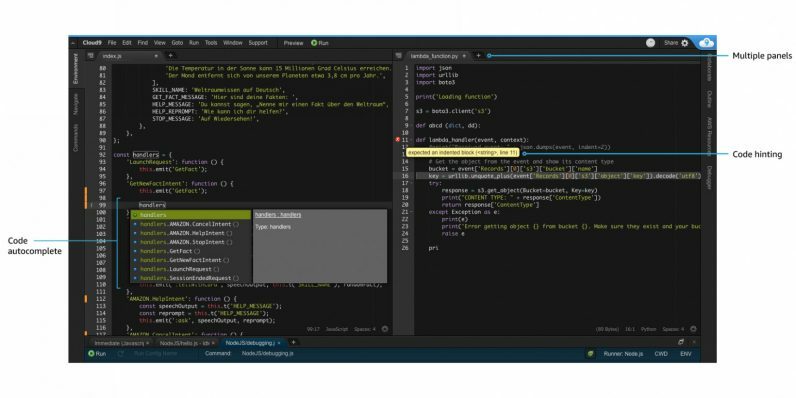 Amazon just unveiled AWS Cloud9, a web-based IDE that supports more than 40 popular programming languages, as well as a bunch of the company’s cloud infrastructure integrations, and collaboration tools. It’s essentially a repackaged version of the c9.io IDE, which Amazon acquired in 2016; it’s now more tightly integrated with AWS. The company says it’s designed for coding, running and debugging all in one place, as well as allowing for serverless development. The main interface is based on the Ace Editor, and is optimized for working on large files with minimal lag. The editor also supports Vim mode, keyboard navigation commands, and the AWS CLI so you can bring up all your resources from the cloud service. Oh, and it also works with Sublime Text and TextMate themes. Additionally, you can fire up new EC2 Linux server platform instances or connect remotely over SSH to an external machine easily. There’s also a panel in the editor to access lambda functions and import them into your local workspace for test and debugging serverless applications. If you want to code with team members, you can simply invite them to a shared environment and work in tandem with multiple cursors and a chat window. Cloud9 is free for AWS subscribers to use; you’ll only be charged for things like computing power and storage with external machines. It’s in the US West (Oregon), US East (Ohio), US East (N.Virginia), EU (Ireland), and Asia Pacific (Singapore) regions. With that, Amazon now has a serious contender against other popular IDEs; by including collaboration tools, it’s set to go up against GitHub’s Atom editor, which introduced similar functionality with its new Teletype feature just last month. Find out more about Cloud9’s feature set on this page. Would you consider switching from your preferred IDE to Cloud9? Let us know in the comments.